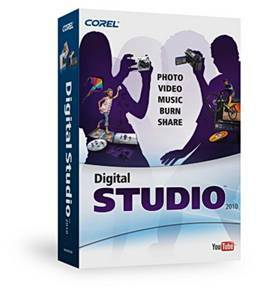 Corel's Digital Studio 2010 suite has four products bundled together. PaintShop Photo for editing your pictures, VideoStudio Express for editing your videos, DVD Factory to burn your pictures/videos and WinDVD to play the movies. Installation gives no choice of the products you want to install and no indication of the space the programs will take. This may part of the process to make the software easier to use, but several other cuts made make the suite ironically a bit more difficult to use. The installation adds shortcuts to PaintShop Photo 2010, VideoStudio 2010, DVD Factory 2010 and WinDVD 2010 to the desktop. It takes just over a gigabyte of hard disc space, when I checked the two directories in Program Files, CorelWinDVD2010 (160 MB) and Corel Digital Studio 2010 (948 MB). Start Menu shortcuts include the Corel Digital Studio Gadget 2010 as well as the programs. This is a launcher that has four icons, Photo (launches PaintShop Photo), Video (launches VideoStudio), Burn (launches DVD Factory) and Play (launches WinDVD). Right clicking the app has two options to Auto Load Gadget (to launch at start up) and exit. As shortcuts are placed on the Desktop and the Start Menu and the Gadget just launches the programs, there is little point in having the gadget at all. As with all the apps, it uses a non Windows standard interface, but with Help, minimise, restore and close icons on the top right corner. There are two message preferences available from the Help menu, 'Keep me informed with the latest product related messages' and 'Automatically download free product updates and notify before installing'. There is no option to notify before downloading though. When you register you dont have any details to type in, just a message that registration successfully submitted and you can download the free content. 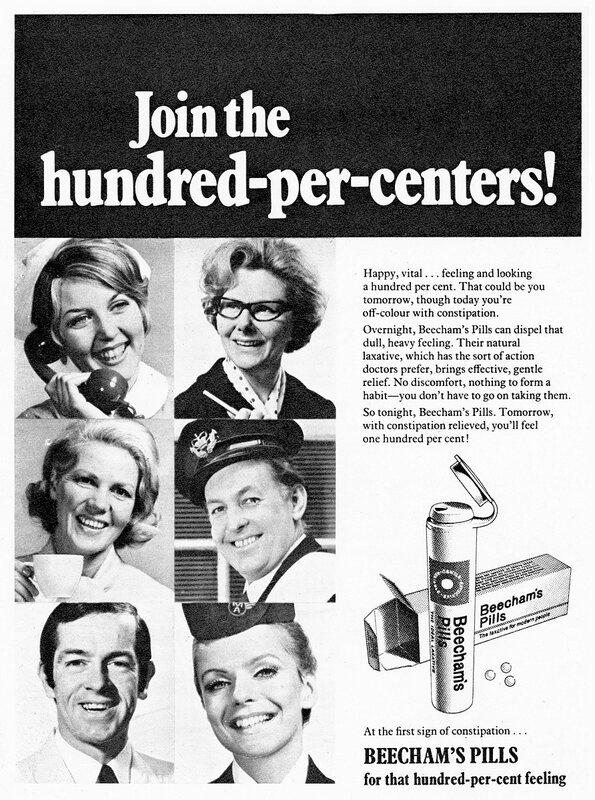 It opens your web browser to download a 15MB IncentivesSetup.exe. I installed the file but didnt know exactly what it added. Some message would have been helpful. The help opens a web browser with the help files, instead of using the operating systems help interface. This is the same for all of the programs. The first time the program is run, it searches for media to include in the gallery of folders. If you import pictures from a flash drive it does not scan the folders, so you have to manually browser them. New folders in the same area appear automatically so you dont have to keep adding them. Importing photos only shows folders on computer hard drive, not network folders. The thumbnails are almost square, not the actual shape of the photo, so landscape and portrait images look same. When editing your photo you can only apply the effect using the slider; there is no option to type a value in, unlike PaintShop Pro. Theres also no preview thumbnail, which going by the speed some of the effects takes, would have been a help. Some effects do have a small preview though. Sharing your pictures from the option at the top gives you a choice of Email, Facebook, Flickr or YouTube. Sending a picture via email works with Outlook or Gmail. You choose whether to embed the photo or send it as an attachment, and can select a size of small, medium or large. It gives an estimate of the file size, but not the dimensions. Facebook upload works fine, putting the photos into an album called Corel Uploader Photos on account. Any picture uploaded needs to be approved and can then be seen by others. Flickr works great as well once the Corel program is allowed to upload pictures/videos to your account. Pictures appear in your Photostream. You can't resize pictures when you edit them, but you can save them with a new name or folder. To resize a picture, you have to select it in the gallery and put it in the media tray (the area at the bottom of the screen). Then you right hand click on the picture there and choose the resize to a new folder option. You choose the folder with a choice of small, medium or large. From a photo that was 3264x2448 this results in a 480x360 (small), 640x480 (medium) or 800x600 (large). You can put the picture in the same folder and it adds a number in brackets to the end of the file name. Why such a simple action as resizing an image is made so complex is beyond me. 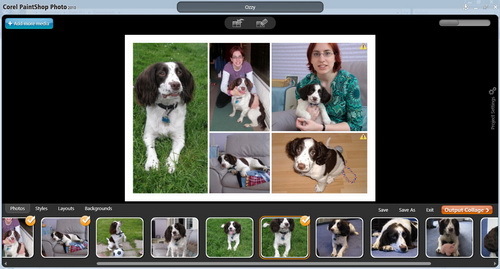 Apart from editing photos, you have six options in the Create option: Photo Book, Card, Collage, Calendar, Slideshow and Backup Disc. Creating a photo book does not take account of the shape of the image, i.e. landscape pictures put in portrait frames. The photo can be panned, but it would be better if it automatically put landscape pictures in the correct frames. There are 7 styles (listed under Fun) but one style only shows half a photo on the page. The Collage project suffers the same problem. 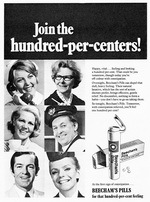 You select photos to add to the media tray, which are used in the collage, but pictures are cropped without regard to the original orientation of the photo. Each image can be panned within the frame, or you can change the settings for the program to shrink the picture. If you do this there will be a grey background and the frame will not surround just the picture. When you use small pictures a yellow exclamation symbol is shown in the collage, indicating that you may not get a good quality print from the small size. Creating a calendar uses a style for the images you choose, but you have to select each page and change the style individually (so thats 12 changes). When I created a slideshow it was supposed to be set to fit to the music, but it didnt. The music started again for about a second at the end. There are only five 'fun' templates to create your DVD menu, and there is no static thumbnail menu. All the menus have a moving preview. The inability to set the thumbnail picture is not a problem because of this, but I found running a preview of the menu crashed the program on Vista after a few seconds. The projects default to a widescreen NTSC. There was no option to set your country, and therefore set the default to PAL, unlike the last full version of DVD Factory. It only burns to a blank disc although it can make video folders in the same process but you cannot just create the folders. You can't add titles to a movie if titles are already added. One template has titles at the beginning and the end, but you can only change the font, colour and words. You cannot change the style and cannot delete them. If you create a movie without titles, you can only add one set, which is added over the video, so you cant create a title screen with a plain background. These limits seem annoying as Im sure it would not make the program more complex to add this ability. You can trim video clips but it was very slow in setting the frames. You cannot set the frame by inputting a number or time frame, only by moving the start and end markers. You then specify if you want to keep or delete the selected part of the video. When you are happy with your video you can save it in a variety of formats: MPEG2 (three quality settings), MPEG4 (iPhone, iPod, Sony PSP, PDA-PMP, Mobile phone), H.264 (1980, 1440, 720 AVCHD), AVI (DV Only), Quicktime (three quality settings), WMV (HD-Best, HD-Better, Broadband, Pocket PC, Smartphone), 3GP (three quality settings). You cannot save in the DivX format. I tried to Import video grabbed from DVD-RAM which was in widescreen. The MPEG was 720x576 but the aspect setting was widescreen. VideoStudio did not see the widescreen setting, so only saw a fullscreen (squashed) video. I was unable to grab video direct from the DVD-RAM disc with VideoStudio itself. 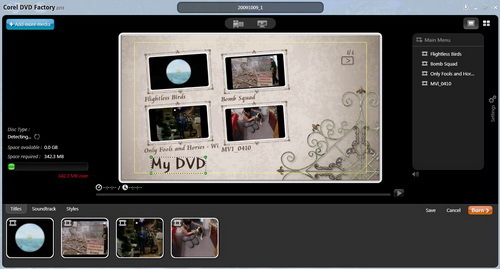 VideoStudio 11 (the predecessor) could not import the video (although it previewed the clips fine) but DVD Movie Factory 7 did manage to import the clips as mpg files without any problems. For both of the video products, you can preview the video in the opening gallery. Unfortunately it only shows the video in the thumbnail size instead of viewing it in a large screen. 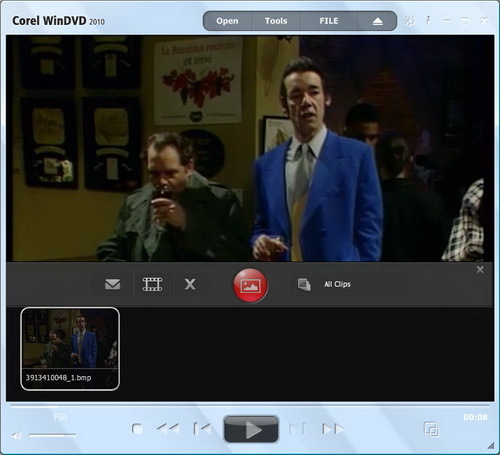 This is pretty standard DVD/Media player but beware when playing widescreen clips that have a full screen frame. Some DVDs and clips recorded from television use a 720x576 full screen frame, but add a flag to tell the playback device that the clip is in widescreen and should stretch the frame. The default setting of fixed aspect ratio in the settings effectively ignores this, and will show a squashed in image. Unticking this option means you can pull the size of the window to stretch the viewable area, and when you choose full screen on a widescreen it will stretch to fill the screen. 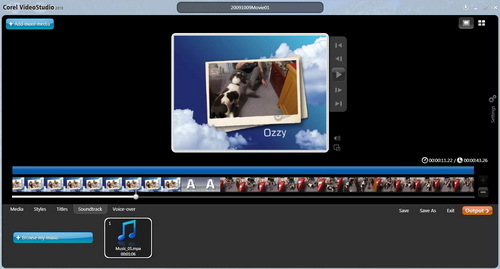 The open file dialog appears over the playback window, and gives thumbnails of the videos. The program does not remember the last folder viewed, and if you double click on the file to select it the file will play, but with the open dialog still appearing over the playback window. It also seems to take quite a few seconds to start playing. You can capture a still frame from a video, but instead of just using a key to capture to a file you have to use Tools, then Capture. This brings up a toolbar in the middle of the playback area with buttons to capture a clip or a picture, and the thumbnails appear underneath as you capture them. It was just a shame that this obscures half of the window. You can access help from the option on the window, but none of the dialogs in the program have context help. If you want to know about a particular setting, you have to search through the help file instead of clicking on a question mark and clicking on the setting in the dialog. There was an update for the product (even though I had the first release of the software for only a week or so) but I had no idea how large the update was. I later discovered it was 19Mb but after installing it required a reboot at the end. The update then ran again when the computer restarted. I have no idea what it fixed, and the update is not listed on the Corel website at all. If you supply a fix for your program you should give the user a clue to what it actually fixes. Another feature of the software is the right click option of Open with Corel Instant Viewer. This works exactly the same as the Windows Photo Gallery option in Vista or the Windows Picture and Fax Viewer in XP except it makes the default sound every time you change the photo, and there is no options setting to turn this off. I do not understand why a feature that is available in Windows is added to the suite; its just duplicating functions. I may have been expecting too much from the software, but the lack of intelligence in the way it handles some pictures and videos means you won't get the high quality results you would expect without doing more work. If this suite is meant to provide an easy way of producing photos or videos, the limitations of the programs prevents you from doing this. As each of the programs are cut down versions of the full products, many features are missing. I'm not sure if the products are available separately, but the suite lacks in certain areas. If you run Windows 7 with a touch sensitive screen you can use the interface with your fingers. As I had Vista and a regular laptop I could not try this, and even if I had Windows 7 the screen is a regular one and so would only get grubby fingerprints if I did!